If his charcoal drawings, oil paintings and four-legged sculptures aren’t enough of a hint, yes, Skip Hartzell is nuts about dogs. 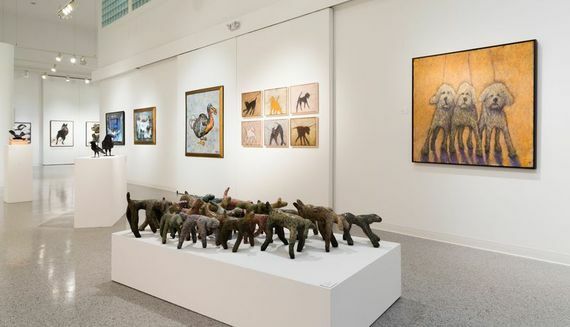 The Lake Worth artist’s website is crawling with canine-based works, and his contributions to the Cultural Council of Palm Beach County’s new group show, “Paws and Claws: Animal in Art,” are no exception. 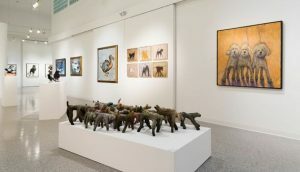 One painting, “Dogs of the Apocalypse,” is as much a tongue-in-cheek nod to pet shenanigans as it is to Hartzell’s fascination with experimenting with a dog’s form, movement, color and texture.